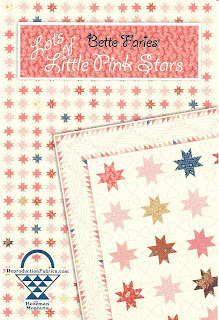 My next reproduction line of fabrics, Little Pink Stars, will be with the new company, Blue Hill Fabrics. The inspiration for the line is a quilt made by my friend Bette Faries. She lived in the Tidewater area of Virginia in the early 1970s. While shopping for Blue Flow china at local antique stores, Bette started to pick up quilt tops and blocks. Always fond of pink, she chose pieces that contained classic double pinks but were damaged or poorly sewn. Bette took everything apart, saving the good parts. Bette's quilt, entirely hand pieced and hand quilted, contains 432 mostly pink star blocks with a sprinkle of other colors: lights, taupe/tan, warm browns and several Indigos. The background fabric is a 1980s broadcloth, all the stars are antique fabrics, 1840-end of the century. My favorite pieces are the delicate trumpet flower mill engraving along with a classic 1850-1900 pad and cover double pink. Bette, an inspiration at 86 year of age, still has a small pile of 19th century double pinks and is currently working on small 9-patches for a full size quilt. Hi Margo: I can hardly wait to see the new line - I have a huge soft spot for double pinks! I gather you will be publishing Bette's pattern as well? Another purchase looms on my horizon!!! I have just returned from a stay at Bettes' ranch in montana. she is a very kind woman. And you can bet she is still quilting every day.